Kristie Nichols has never felt safe walking down Merrimon Avenue, a commercial street close to her house in Asheville, North Carolina. Drivers speed down the four-lane road, roaring uncomfortably close to anyone on foot. “There’s people that walk and people that run but there’s no buffer between the cars and the sidewalk at all,” said the mother of one. In 2015, a driver struck and killed a woman crossing Merrimon. Residents of Ashville’s Five Points neighborhood had warned state officials the intersection was dangerous, to no avail. Now Nichols is worried the situation will get worse. She and her neighbors were alarmed to learn that the North Carolina Department of Transportation is planning to widen the road to five lanes to add a turn lane. The impetus for the project isn’t exactly clear. With about 21,000 vehicles per day, traffic volumes are the same as a decade ago, according to official counts provided to the Citizen Times. But the four-lane configuration causes a lot of weaving, as drivers heading straight maneuver around drivers making turns. NCDOT plans to add a sidewalk to a section of the road that lacks them, but by widening the roadway, the project will lead to more dangerous vehicle speeds and make conditions for walking and biking worse. The outer motor vehicle lanes will be 13 feet wide, inviting drivers to hit the gas. Mike Sule of the group Asheville on Bikes says that’s not acceptable, especially since Merrimon Road was singled out for improvements in the city’s bike plan, which was paid for by NCDOT. Nor does NCDOT’s plan comply with the state’s complete streets policy or its purported commitment to “Vision Zero.” It would also require the demolition of a few businesses. Don Kostelec, a planning consultant who was based in Asheville until recently, says he doesn’t understand why NCDOT didn’t present the public with a range of options, as required by federal environmental rules. 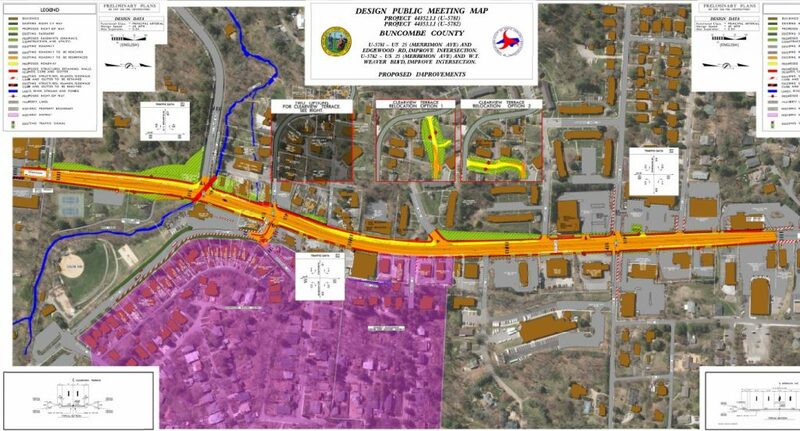 Instead, the 160 people who attended a meeting held by NCDOT were shown just one plan — the widening. It didn’t go over that well, the Citizen Times reports, with about half the room opposed. One way to address the weaving issue while improving safety for everyone would be to convert the two center lanes on Merrimon into left-turn lanes while adding bike lanes by the curb. This would separate left turning movements from through traffic, while reducing speeding, giving pedestrians fewer lanes to cross, and creating dedicated space for cycling. Commonly known as a “road diet,” this is a well-understood design solution with a proven track record of improving safety without causing traffic back-ups. Traffic volumes on Merrimon are around the upper limit of what’s recommended for road diets. Previous studies of Merrimon recommended something similar, Kostelec said — turn lanes at intersections rather than a full widening. NCDOT could try out the road diet for a pittance, since implementation only requires paint, he notes. Nichols expected Asheville to be more walkable and bikeable when she moved to town a year and a half ago. Her neighborhood, Murdoch-Linden, is full of historic homes. But commercial corridors like Merrimon Road remain inaccessible and dangerous. Seriously? A 2′-0″ “shared bike lane?” That’s malicious, not incompetent. That “bike lane” looks redonkulous. But so does the suggestion of a reduction to 3 lanes with bike lanes. That will increase chances of right hooks for cyclists over the current configuration. A 5 lane configuration with narrow outside lanes, sharrows and BMUFL signage serves the needs of everyone best. No right hooks if your controlling the lane properly. No cars swerving to get around left turning traffic. Open left lane for passing cyclists using the right lane. There’s plenty of width in this ROW to accommodate everybody safely. What are your assertions based on? I ride 5 lane roads daily with no trouble and less stress than when I’m on a road with bike lanes and having to constantly be mindful of possible cars about to make right hooks across my path. What a cluster boff. NCDOT should be ashamed. Regardless of horrible bike infrastructure, how are they going to get 75′ ROW? They will be in the front lobby of many of those businesses. Building face to building face at Youngblood Bicycles and Asheville Cleaners is less than 60′. Farther north Merrimon drops to two lanes! They should start with a 4-to-3 diet using a TWTL (two way center turn lane) since they have lousy access management and frequent driveways that contribute to the turning conflicts from the inside lanes. While at the upper limit for a diet, all those turns are sure to be a primary delay inducer (and crash issue). And in the process, close some of the redundant driveways to reduce conflicts. Since there is considerable topo relief they could also use a wider climbing bike lane (greater speed differential) and a shared lane in the downhill direction to help reduce potential for right hooks. I don’t know why they specifically reference a 2′ “shared bike lane”. WTF is that? Anything is better than what they have proposed with this project. Depends on how the intersections are designed. Realistically, most people default to edge riding even in the presence of BMUFL signs and sharrows, so the presence of a marked bike lane at least provides a semblance of expectancy. It looks like DOT may take this thing back to the drawing board. So assuming they do, what now? This four lane sees upwards of 20,000 cars a day. It is definitely pushing the limits of a road diet. If they do put in three lanes, a shared center turning lane, and bike lanes, it’ll be the first of its kind in the city. If it creates traffic it might be the last. It’s possible some traffic will be able to use alternate routes like 26 or Broadway. I iniw there are traffic simulaters, how does that get done? Also if we’re going to just use paint and try it out, we’ll need much better base line data, especially traffic volume and time measurements. Ideas and comments welcome. We need a good design that won’t backfire on multimodal advocates.